In my brief five years of judging, I cannot count how many times I have communicated to exhibitors that I am not judging a statue. I offer this as relaxing encouragement to them while they attempt to correct their dog’s stance as it is being examined. However, many handlers persist, sometimes in vain, to replace dog’s feet in positions that the dog has already decided were uncomfortable. Immediately after a correction, many dogs will then go on to move their other feet. At this point, it is my policy to recommend to the exhibitor not to bother fidgeting with the dog, as I politely tell the handler I can feel everything I need to feel, regardless if the dog has moved its leg or shifted its weight. Simply, I am judging a live animal and not a statue. Some exhibitors will listen, others persist perhaps because they perceive the dog’s movement as an affront to their handling skills. For clarity, references to handler is meant to be all-embracing, for any person showing a dog. Here on this point, I offer a suggestion to exhibitors. I typically walk my dogs into their show stack. I usually do not fidget with their feet unless they are in an exaggerated stance such as “posting.” This allows the dog to feel comfortable with the process of examination, especially the Sighthound breeds who can be more averse to a stranger’s approach and hands-on exam. Moreover, walking the dog into a stance is much more relaxing as the dog usually will land and stand over their ground in a comfortable position. Remember, the sole purpose for dog shows is not a contest as to which dog can stand still the longest, in some cases in an excessively exaggerated posture. The purpose of a dog show is to select and adjudicate over the best of the stock to perpetuate the breed. I will quickly digress here to expound on my remark about exaggerated postures. One such profile example is frequently seen in Afghan Hounds, with many of the dog’s rear feet stacked well behind the seat bones of the hindquarters. If you dropped a plumb line from the Ischial Tuberosity (rear seat bones), it is supposed to touch the front of the toes of the rear feet, however, due to exaggeration in stance or construction, that plumb line, in some cases, is far forward of the rear feet. Commonly, when stacked in such a manner and before the dog can move, he must first bring the rear legs back up under his pelvis, with some returning to a normal stance before stepping off. Other dogs, while standing naturally or even four square, are able to lead off immediately with their front leg. If such exaggerated stances were correct for the structure of that breed, then that dog would have no need to bring its rear up and under him first before he could lead off on a front leg. Not all exhibitors are skilled and simply fussing. My biggest point of disagreement while observing some exhibitors is the clumsy effort to correct a stack by reaching over the back, grabbing the loin and pulling the dog’s hindquarters towards themselves. This action does not achieve a relaxed stance in which the judge can reflect upon and appreciate a lovely silhouette. Instead, this grappling produces a dog who was just dragged into position and who now is flexed and tense. Never mind it is very uncomfortable for observers – effectively making us cringe – and usually the handler does not stop there. After they drag the back end of the dog over to a side profile, they begin wrestling feet into place. This struggle is no more graceful than the first as the exhibitor pushes and pulls, then drags feet backwards and forward. Sometimes it is comical as the judge gives up or is impatient and approaches the dog while the exhibitor is still wrestling with the feet, head bent down with their buttocks up in the air. A solution for inexperienced exhibitors is taking five minutes every day to work with the dog by teaching it to walk forward into a stack. The stack does not have to be perfect because, again, we are not judging sculpture. Teach or train the dog on its show lead — not a walking lead so they can differentiate when they are working — and train the dog to walk slowly forward as they place their front legs straight up and down with elbows directly under their shoulder blades, their hocks perpendicular to the ground. When showing, if one leg is back somewhat, don’t fret, leave it. If the dog’s stance is still unacceptable to you, correct it after the judge has completed their exam and not while the judge is examining the dog. After the judge is finished, quickly readjust or if it is a body shift then slowly walk the dog forward one or more steps to the desirable stance. Every judge should allow the exhibitor the few extra seconds, if the handler chooses to do so, to walk the dog forward a step to correct a bad stack. This is courteous to do so since it is the exhibitors hard-earned money paying the judge for the evaluation, not visa versa. Likewise, walking into a stack is a bonus for bona-fide judges, those not looking at their wristwatch, as most dogs tend to relax and settle into themselves quickly. No matter the handler’s choice, just please stop wrestling. Conformation purebred dog events have been transformed into a showing and grooming contest. Today we observe many firmly established handling habits. Exhibitors will place huge emphasis on a dog’s stack while on the table or ramp. If the dog moves, the exhibitor constantly makes corrections, as if the judge will not be able to feel the placement, angulation and length of the bones and muscling, or quality of coat if a foot is out of place. Moreover, exhibitors need to remember that judging does not take place on these elevated platforms, only examinations. Dogs are only judged on the ground. If the opposite were true then each of these dogs would be exhibited on a table or ramp in the ring always. Perhaps this habit has manifested itself so widely because exhibitors follow the lead of many professional handlers who have perfected the ability to emphasize perfect, statuesque stacks. Consider an exhibitors reaction the instant a dog moves their head to look around while stacked in the lineup. Many have a death grip on the muzzle. A reminder to everyone in our sport, dogs should not receive extra consideration for being able to stand still the longest. Other established and trying habits include handlers overemphasizing certain breeds abundance of thin, loose skin, wrinkles or folds. Short-coated breeds are “what you see is what you get.” Still, we have exhibitors over-accentuating by grasping and pulling the skin up and forward. The judge is not blind and can clearly see and feel the skin’s looseness, along with scapula placement, without the aid of the handler. As an extra factor, I have heard disapproving comments by spectators. Although we seasoned fanciers understand this does not hurt the dog, no amount of reassurance can change some people’s minds. Taking into account the purebred dog controversy in place today, we can do away with such unnecessary elaboration. Another annoying and dispensable habit during examination are handler’s stretching dog’s neck, pulling upwards, almost lifting the dog’s front off the ground and then flipping the ears over both eyes — all in a grandstanding effort to feature the neck on a smooth or short-coated breed. Speaking plainly, a judge is quite capable of discerning a proper neck without all this dramatizing, especially since most are approved to judge heavy-coated and long-coated breeds. If the judge requires or encourages such elaboration on a neck then they should reevaluate their role in our sport. Dog shows were not meant to be a contest of animal or people showmanship. Our shows were not created or designed to determine who is the more flamboyant handler, for instance the handler standing out nearly four feet in front of the dog waving a piece of bait in their free hand. Some handlers claim that the dog who is posed looking very much like a sculptured bronze is, indeed, in a natural stance. Occasionally, this may be true and usually can be determined by directing the handler to move the dog around to the center of the ring and having them stop without touching the dog. Few times will the dog land as they were previously stacked. Many times, the dog will land and stand much more naturally, which a true breed expert will appreciate moreso than an over-dramatized stance. In truth, show dogs increasingly now are trained to stop and self-stack in dramatic poses without interference by the handler. Yet, what I would find most telling is if we were to see the same dog running and playing in the yard or field they most likely stop and stand in an entirely different manner contrary to dog show pageantry. Taking into account these critiques, it is no wonder almost all exhibitors fret constantly about a misplaced foot, constantly adjusting and readjusting legs, death grips on the muzzles, stretching out necks, pulling the skin over the dog’s face and so on. These dispiriting comments all highlight the non-essentials of our sport. Why place more value on the dog flying around the ring at the end of their lead, many at incorrect speeds? Why do judges value the dog in an aggrandized, statuesque stance moreso than its competitor(s) who may fidget but who stands over their ground in a comfortable, confident manner sans embellishment? Doesn’t breed type and symmetry trounce being overdone and flamboyant? We should all worry about the general direction in which our sport has developed. It is deeply concerning and saddening for many veterans. Over the years, our sport has been steered towards glorifying and worshipping the most highly trained and unflinching statues. This is a show with live animals, not a statue exhibition. Though I would not nor am I suggesting a dog should be penalized for being perfectly trained and very stylishly shown, at the same time a judge should not bestow additional merit on this dog over its competitors based upon this ability to attract, in many cases, undue attention. However, we are very much aware of this or similar preferences by some judges through their critiques. Absent from reviews are conclusions on a specimen’s structural integrity, the virtues of that dog’s priceless breed type expounding on the near flawless shape, describing the breed’s topline and underline, discussing the prosternum, its fill and relative station and length of ribbing. Going into detail about the dog’s diameter and length of bone, the breed standard’s ideal length, strength and breadth of loin or the opposite, well-coupled with strong breadth of loin, or remarks on the symmetry of the dog’s conforming length and placement of scapula/humerus in relation to the femur/tibia, or any mention of superior muscling. On occasion, we do hear vague comments about headpieces as they are first discernible and easiest to describe. All the same, the comments provide little insight such as, “What a lovely head.” We do not read instructive remarks about proper length of planes with degree of desired stop, eye set and shape, width or shape of skull and muzzle. Overall, in place of educational particulars, we are provided nebulous, frivolous comments. This may be due in part to judges’ inexperience with formulating and expressing their opinions, remarks and reactions to the dogs. Many quality judges with a keen eye instinctively know a good or great dog when they see one and have trouble conveying why, then there are other judges who skate by with a quick but insubstantial remark about, “how spot on” a dog was in the ring. What is the value of saying this? How does that have anything to do with the breed standard for which the dog is judged? It is no wonder that our sport is filled with uninstructed, naïve exhibitors and breeders. If they hear or read a judge’s explanations about the winning dogs and all they are offered are the aforementioned, meaningless comments, then it should come as no surprise that our sport has devalued. These comments undermine the importance of, the genuine purpose of our sport, why and how it began. It does not have to be this way. 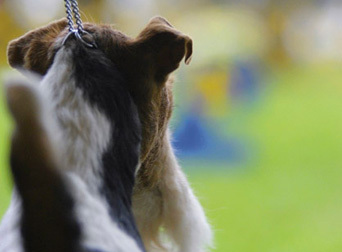 We judges can effect change, have a marked influence on breeder and exhibitor priorities which, in turn, will return focus on breeds’ standards of excellence. As I am very fond of repeating, we need to get back to the basics.